Buy 22 or more for $14.24 each. Christmas is almost here, which means ice-skating, Christmas carols, and sparkly lights everywhere—even on Snoopys doghouse! Everyone is enjoying the holiday celebrations except Charlie Brown. 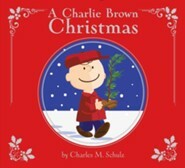 Can the Peanuts gang help Charlie Brown discover the true meaning of Christmas? Charles M. Schulz is a legend. He was the hand and heart behind fifty years of Peanuts, which featured one of the worlds most beloved and recognizable casts of cartoon characters, until his death in 2000. I'm the author/artist and I want to review A Charlie Brown Christmas.